As of version 6, you can adjust the light levels and coloring in all of your camera sources whether they are local (directly connected) or remote. You can adjust the shot's Hue, Saturation, Brightness, Contrast, Lift, Gamma, and Gain with aid from three different color monitors. Color correction settings are available for each camera input except Mevo, as Mevo includes its own image adjustments setting built-in, which is also accessible in Studio once a Mevo is connected. 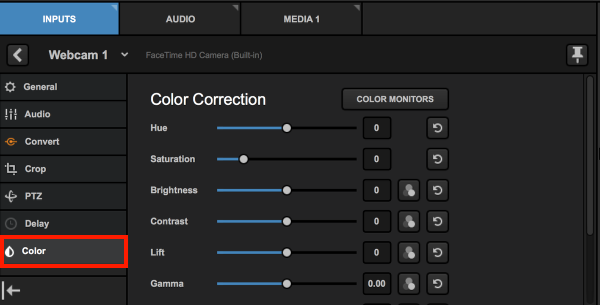 Color correction settings cannot be applied to GFX or Media sources. Navigate to the Inputs tab in the lower left corner of the interface. Select the corresponding gearwheel to the input you wish to adjust. Along the left side of the panel is the Color tab; selecting this opens the Color Correction menu. A helpful tool when color correcting is the Color Monitors window. There are three monitors you can use when making adjustments to your image. By default, you will see the Waveform monitor. This monitor helps measure the blacks and whites in your image from left to right. In this graph, you want to make sure all of the data (the green waves and lines) are within this monitor (between 0 and 100 on the left side). Open the dropdown in the upper left corner of the window to see two more options: RGB Waveform Parade and Vectorscope. RGB Waveform Parade will show waveforms for each of the three video channels (red, green, blue), informing you of the overall color balance in your shot. The closer all three match, the more balanced your video will look in terms of color and temperature. In the below example, red is higher than green, and blue is the lowest; this is because the shot has more red tones in it as it was taken during sunset; if we balance these waveforms, it will look more like midday. 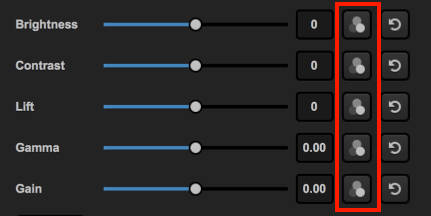 Similar to the Waveform, you want to make sure your colors aren't crushing all the way to the top or bottom (unless you're going for a specific look). To adjust these, open the color channel settings that are available with each light adjustment setting (Brightness, Contrast, Lift, Gamma, Gain). By pushing up the blue and reducing the red, we now have a more color balanced shot. Vectorscope measures hue and saturation. In other words, it tells you what colors are most prominent and by how much. If you lower your saturation, the pixels in the middle will reduce and your image will look more black and white, whereas a saturated image will show the pixels more spread out towards the edge of the scope. Note that each color has a pair of squares, one closer to the center than the other; the more-center square represents the pure color while the square farther to the edge is a super pure color (e.g. Yellow and Super Yellow; these are both seen if you use HD SMPTE color bars). Hue: The actual colors that you see. Hue is a 360-degree measurement that reflects where on the color wheel the colors in your shot fall. You can adjust it down to -180 degrees or up to 180 degrees; you will notice these two extremes will be nearly identical in color but opposite of the neutral position. If you have the vectorscope open when you adjust this setting, you will notice the pixel pattern will spin like a wheel as you adjust the slider. Saturation: The amount of color. If you reduce saturation to the lowest setting, your shot will be nearly black and white. Slide it to the right to increase the color in your shot to be closer to pure color. Keep your vectorscope open to ensure you don't over-saturate your image (i.e. pixels should not surpass the squares). Saturation increased, giving this shot more color, especially in the yellow/orange regions. Brightness: Adjusts all of the lightness and darkness in your image symmetrically. In other words, your white and blacks will move up and down the same amount, causing an extreme white when adjusted all the way up and an extreme black when completely reduced. Keep an eye on your waveform monitor while adjusting this, and consider using Lift, Gamma, and Gain before adjusting Brightness. When Brightness is increased, the entire waveform stays in the exact same shape but moves higher in the graph. This is what we mean when we say it adjusts the light in the shot "symmetrically." Contrast: The difference in brightness between the darkest and lightest areas of your image. This is another setting where your waveform graph will be helpful. Unlike Brightness, your blacks and whites will move the same amount, but in opposite directions. An image with low contrast will show the waveform more condensed to the middle and appear very gray and flat, whereas an image with high contrast will be more spread out from top to bottom. This is another setting you should consider waiting on changing until you adjust Lift, Gamma, and Gain first. Increasing Contrast will show the waveform spreading apart evenly, with lights getting lighter just as the darks get darker. Lift: This controls the level of black in your shot without modifying the white. The waveform will show the bottom half of the graph move the most when adjusting this setting. You will get all white when raising the lift all the way up. Lift has been lowered, darkening the black tones with minimal impact on the whites. Gamma: This controls the range of gray tones (or mid-tones) without modifying true black or true white. Gamma has been raised, with the most movement happening in the middle of the waveform. Gain: This controls the white levels in your shot without modifying the black. In other words, this is the opposite of Lift. If you push this all the way down, your shot will be entirely black. Gain has been increased, dramatically increasing the lighter tones in this image and the darker tones barely adjusting. While Lift, Gamma, and Gain all focus on different areas of light in your image, adjusting them will still impact the appearance of the entire shot. Consider using those three settings to adjust the lighting balance in your image first, and then use Brightness or Contrast to help boost those adjustments as you see fit. If you have two (or more) cameras pointing at the same shot and you want to compare them, the easiest way to to do this is to select the pin icon to add the input as its own tab for easy access. Then go back to the Inputs tab and open the settings for another input. Pin as many cameras as you need to compare. You can then open the color monitors for each input, then compare and adjust accordingly. The name of the input will be at the top of the window so you know which one you're adjusting. You can alway un-pin and re-pin inputs as you need. If you've overdone it on a color correction setting, you can click the arrow button next to that setting to reset it to the default position. 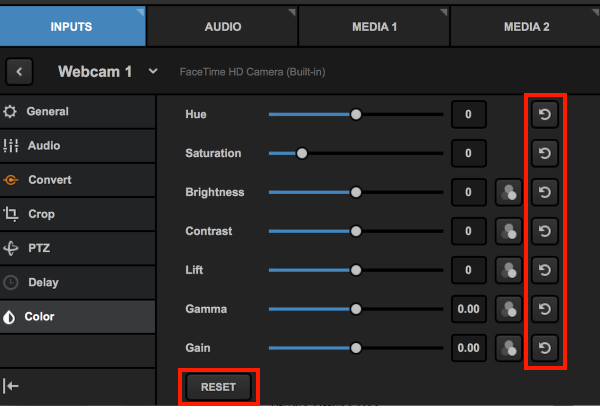 If you've adjusted multiple settings and want to start from scratch, click the Reset button at the bottom of the Color Correction menu to reset all settings back to their defaults.